Banku and Tilapia is a traditional Ghanaian dish that is very common amongst all regions in Ghana. Banku is basically a mixture of corn dough/flour mixed with cassava dough/flour. It can be eaten with various sauces such as stew, hot pepper sauce, soup etc. 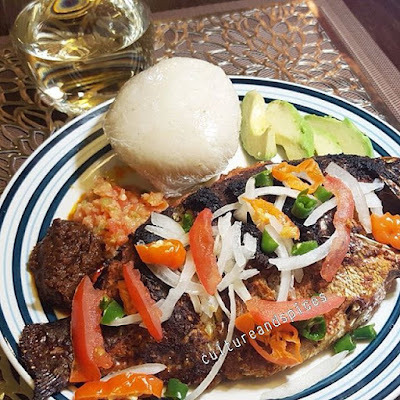 Tilapia is a river fish that is a delicacy in Ghana. It can be used for stew, soups and also eaten by grilling, baking and frying. For Banku, Mix equal amounts of cassava and corn dough in a pan Add water to the mixture and stir till it looks porridge like Add salt to the mixture and put it on fire Stir the mixture with a wooden ladle As mixture begins to thicken, continue to stir till it becomes a thick pulp Continue to stir until color of the mixture changes to a light cream color. Depending on how spicy you want it, the amount of tomatoes, pepper and onions could vary First, chop fresh habanero peppers, about two or three and about half of an onion into a blender with a pinch of salt and a Maggie cube or half a cube Blend the mixture into large chunks and then chop some tomatoes into the blender. Blend the whole mixture together. For Tilapia: Start of by cleaning the fish, getting rid of scales, the stomach and also removing the fins. These steps are optional as some people just go ahead and season the fish without cleaning it Blend about 1/2 onion, ½ of garlic and ginger with about a teaspoon of oil, 2 Maggie cubes and salt (these type of seasoning are optional. Other kinds can be used). Depending how many fish you are making, you may have to add more or less of the onion, garlic and ginger. Season the fish with the mixture and bake/fry/grill at preferably medium heat to prevent the fish from burning. Tilapia does not take very long to cook. The median time is about 20-30 minutes when baking.